Within the state of absolute truth, there is no duality such as “obstacle” or “ally” or “good” or “evil.” However, from the perspective of the relative existence of sentient beings, there is the experience of harm coming from bad things and support coming from good things. Therefore, from his great compassion, Buddha Tönpa Shenrap Miwoché displayed the methods of how to subdue harmful forces. These harmful forces included a large group of demons in the world who not only believed wrong views but had a great hatred for human beings. Son of the powerful demon king, Düje Thöje, was the demon prince Khyappa Laring. From his black palace, Prince Khyappa Laring perceived a bright, unexplained light coming from the human realm in the land of Olmo Lungring. Looking more closely, he saw that Lord Tönpa Shenrap Miwoché was teaching and encouraging activities of virtue and wisdom and that many human beings were following his teachings. Infuriated, he devised a plan using nine different deceptions to deter the work of Lord Tönpa Shenrap. 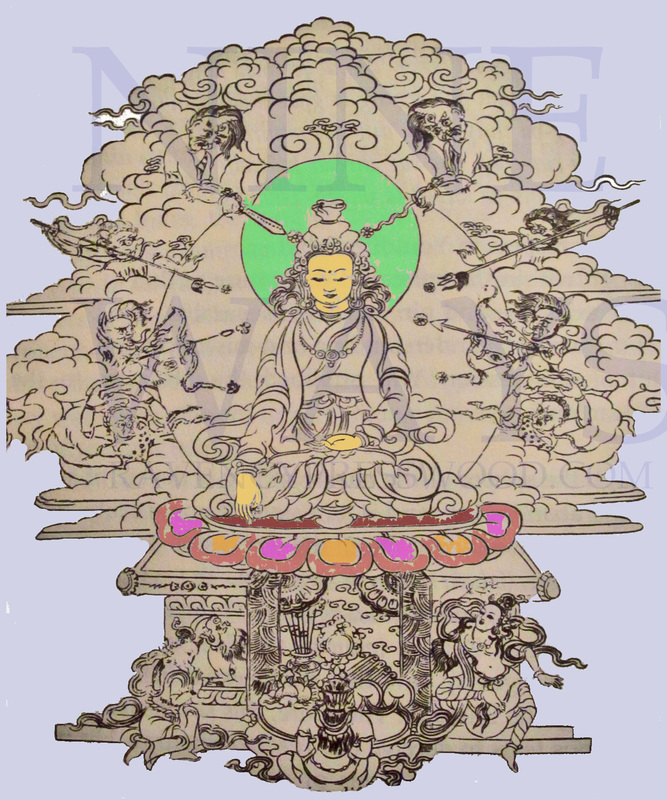 First, he appeared as the enlightened White Light Deity, Shenlha Ökar. While appearing in this way, he told the Great Teacher that because times had changed, he should stop teaching and simply follow his own desires. Recognizing this as a demon, Lord Tönpa Shenrap left the area and began teaching elsewhere. The demon prince then manifested in turn as Lord Tönpa Shenrap’s Lama, his father, his mother, as five carefree youths, as five beautiful young girls, his brother, and his son. All the while, the demon prince tried to convince Lord Tönpa Shenrap to stop teaching and follow the ways of non-virtue. Each time, he failed. Frustrated and angry, Kyappa Laring decided to use wrathful means to achieve his goal. He conjured up a massive army of demons who attacked Lord Tönpa Shenrap with their weapons. Remaining stable in his meditation, Lord Tönpa Shenrap transformed the weapons into beautiful flowers. Following this miracle, the Great Teacher bestowed teachings of the Yungdrung Bön to the demon army and all of them were converted to the mind of virtue and became disciples. Helpless to continue the attack, the demon prince Khyappa Laring pretended to become a disciple as well. During the day, he appeared to be good and obedient, but at night he continued his activities of harm and destruction. He tried seducing the wives of Lord Tönpa Shenrap but failed. However, he managed to trick his daughter, Neuchung, by using a magical emanation of seven handsome youths that invited her to their kingdom. Internally, Neuchung had felt doubt about her father’s teachings and so went with the youths. The most handsome of the youths was actually the demon prince who seduced her and eventually took her as his prisoner. During this time, Lord Tönpa Shenrap was teaching in a god realm but was aware of the situation through his unobstructed clairvoyance. He sent an invisible emanation of himself in the form of a large garuda to watch over his daughter. Once realizing her error, her father had her returned to Olmo Lungring. There, she confessed her doubts and presented five offerings of light, incense, pure water, food, and flowers as an act of atonement. Having thus far failed in all of his attempts to stop the teaching of Lord Tönpa Shenrap, the demon prince Kyappa Laring decided to attack the Great Teacher’s property. He had his demon emissaries steal seven of his best horses and take them far over the mountains and plains into the region of Kongpo in Eastern Tibet. Having no attachment to the horses, but seeing that the time was right to introduce the Yungdrung Bön into Tibet, Lord Tönpa Shenrap began to slowly pursue the demons. Seeing that he was being followed by the Great Teacher, Khyappa Laring sent many magical creations to try and stop his pursuit. All of these failed. Crossing into Western Tibet and reaching the great Mt. Tise (Mt Kailash), Lord Tönpa Shenrap blessed it and left his footprints in a rock near the mouth of the Tsangpo River. The Great Teacher having reached the thick forests of Southeast Kongpo in Eastern Tibet, the demon prince manifested a great mountain in order to block his way. Lord Tönpa Shenrap pushed down this mountain, and with the great power of his mind, created another to take its place for the future benefit of his disciples. This is the holy Bön mountain, Kongpo Bönri. The demon prince then forced the king of Kongpo and his armies to fight against the Great Teacher. But again, their weapons were transformed into flowers and all attempts to defeat him failed. 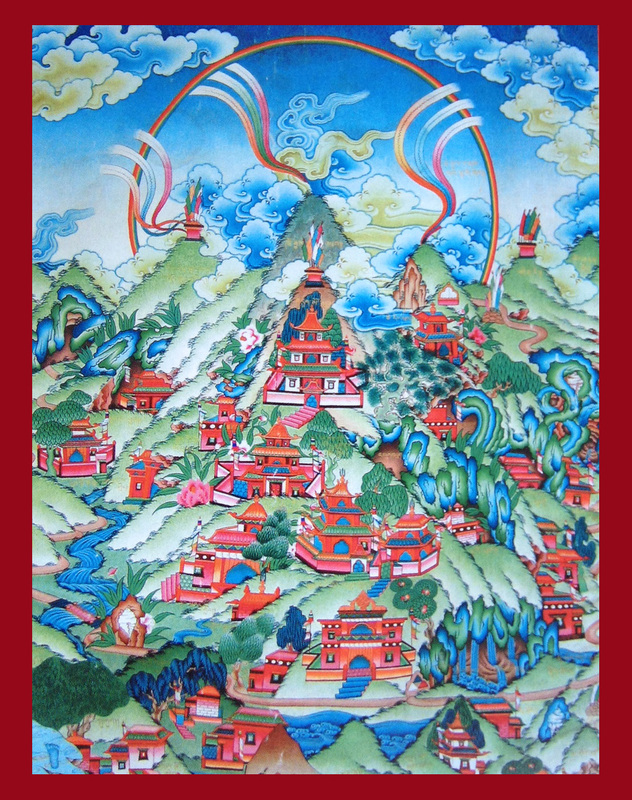 The people of Kongpo were terrified by the battle and amazed by the glorious power of Lord Tönpa Shenrap. Thus, they were converted as his disciples. However, because the population of Tibet was still under the strong influence of demons, Lord Tönpa Shenrap focused his teaching to them on the Causal Vehicles of Yungdrung Bön which include teachings on the great non-virtue of blood sacrifices and instead the benefit of proper offerings and veneration of the powerful worldly gods, and methods of sending away or subduing negative forces. Although he mainly taught from the Causal Vehicles of Bön at that time, he prophesied that in the future, the time would come that the Tibetans would be ready to receive the higher teachings of the Yungdrung Bön. His army again having abandoned him, the demon prince spent the daytime listening to the instructions of the Great Teacher and spent the night time destroying things. Still, he plotted his revenge. One day when Lord Tönpa Shenrap had gone to Mt. Meru, Kyappa Laring used trickery to convince the Great Teacher’s wife to set fire to the boxes containing Shenrap’s teachings. Feeling satisfaction as the scriptures burned, the demon prince went on his way. One of Lord Tönpa Shenrap disciples ran to the fire and tried desperately to extinguish it with no success. However, aware of what was happening, the Great Teacher had blessed the fire. Among the ashes the great five warrior seed syllables of AH OM HUNG RAM DZA remained. From this mantra, all of the letters were recreated and the entirety of the scriptures written anew. Posted on March 23, 2016, in Iconography, Tonpa Shenrap, Uncategorized. Bookmark the permalink. Leave a comment.